This photo was taken with the iPhone app, "Diana." Digital Digital Diana replicates the 1960s cheap 120 camera called the "Diana." This toy camera was made entirely of plastic, and quality control was lacking. Considered a dismal failure, the Diana was discontinued in the 1970s. Like any artist, only after death is their true beauty and value discovered. In later years, the Diana became a cult classic among photographers who consider their work art. The dreamy, out-of-focus, grainy, light-leaked images lent unique moods to the photos exposed in the little blue plastic camera from Hong Kong. Each Diana had a character of its own. Like snowflakes, no two lenses were alike. The Diana quickly rose to the paramount of the cult art class, making it one of the most sought after, extinct analog cameras ever. (description taken from iTunes App Store). 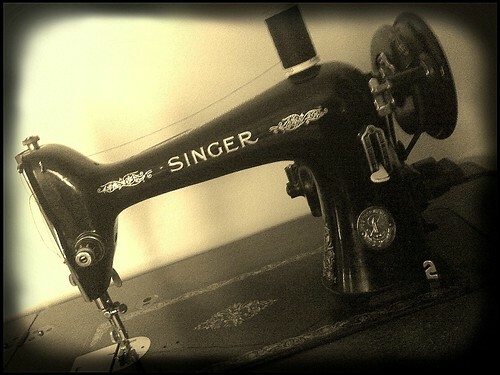 I thought my old antique Singer sewing machine to be the perfect subject for my debut into Diana photography. I got this machine in a yard sale for $10, put $80 into it, and Alhamdulillah, I have a great working machine. So much so, that I gave my new one away! It is truly a spiritual experience to use this sewing machine. It's one of the first Singers converted to electricity. Masha Allaah that they kept the beloved Singer body. I wonder if there's a Polaroid app! There is! Go to the ap store and put Polaroid in the search square! I look forward Insha Allaah to seeing some of your Polaroid pics! Masha Allaah, the Cats of Istanbul!